Among the many famous things New York City is known for, food is definitely one of them. Regardless of where you are in the City, there are always tons of restaurants that crowd the sidewalks. And while NYC is constantly star-studded, there are a few hot spots in that are known for hosting celebrities — and maybe if you’re lucky, you’ll run into a few yourself! 1. Rosie’s: This authentic Mexican restaurant is located in the East Village and has hosted Jessica Simpson and husband Eric Johnson in the past. The restaurant has amazing reviews, and combines all the best aspects of Mexican food to create an incredible experience. It’s no wonder why Simpson and Johnson are fans! 2. Zuma: Gigi Hadid and her mother, Yolanda, were spotted at this Japanese restaurant having a girls night. The pair apparently indulged in some sushi rolls at the Midtown Manhattan spot. This super expensive hotspot is known for their high-energy and delicious food. 3. Maialino: This Tuscan-themed restaurant is not only notorious for their amazing food, but their romantic atmosphere too! Jimmy Fallon and his wife, Nancy Juvonen dined at Maialino for a date night recently, but former President Obama and First Lady Michelle Obama also made a stop in 2014! 4. Loring Place: Located in Greenwich Village, Chrissy Teigen and husband John Legend raved about this hot spot. This high-end restaurant is famous for their wood-fired dishes, including handmade pizzas and pastas. And, of course Teigen raved about the food on her Snapchat, so we know it has to be amazing! 5. 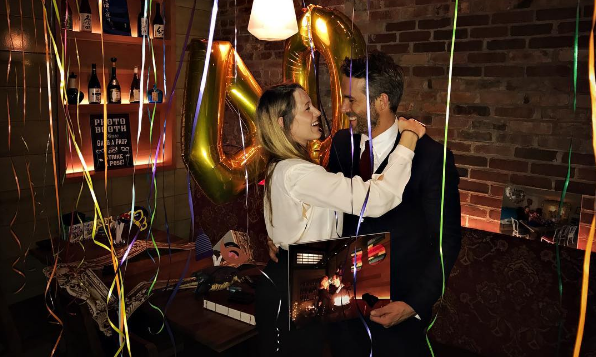 O Ya: This restaurant hosted Blake Lively and Ryan Reynolds for his 40th birthday! The celebrity couple apparently fell in love at the spot’s Boston location, but have raved about their modern Japanese food. The couple recommends the restaurant’s creative take on sushi, along with their sashimi and wagyu beef. What are some of your favorite places to eat in NYC? Share below!